Coffee Coming Up, Nice And Hot ... And Prepared By A Robot : The Salt The 50-square-foot Coffee Haus from Briggo offers made-to-order espressos, cappuccinos and other specialty brews from direct-trade beans. Like any good neighborhood barista, it will even remember your favorite order. Briggo's Coffee Haus takes up about 50 square feet of space, has a nice exterior wood design, and accepts orders either on-site or via a website. A new trend is brewing in the coffee world: coffee prepared by a robot, able to be preordered via cellphone and picked up at an unmanned kiosk, perfectly adjusted to your taste and ready to go. To some, this might seem lamentable: the beginning of the end of coffee shops as we know them. No more huddling around warm cups of coffee with friends or sipping a refreshing iced latte while reading. But to others, this might be just what they've waited for: no lines when you're in a rush, and coffee prepared by a machine that is programmed to make it perfectly time and time again. 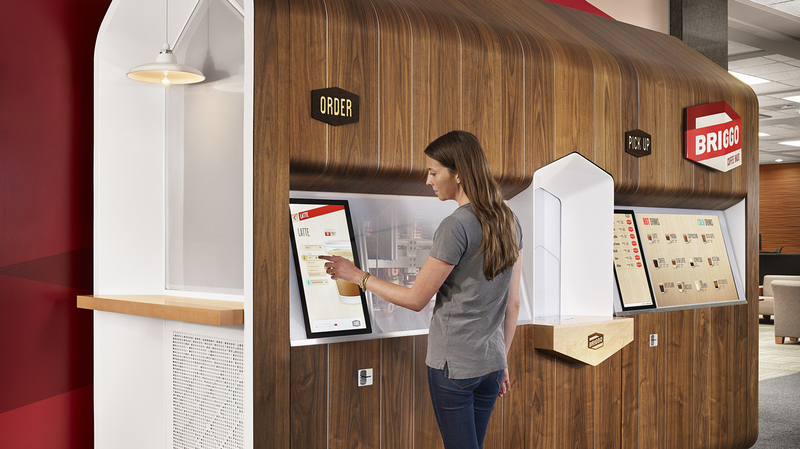 The latest company to present such a coffee kiosk is Austin-based Briggo. As Quartz recently reported, Briggo opened its first kiosk on the University of Texas' Austin campus in July of this year. The kiosk — dubbed "The Coffee Haus" — takes up about 50 square feet of space, has a nice exterior wood design, and accepts orders either on-site or across campus via a website, informing the customer precisely when the drink will be ready. Customers are able to control every detail to their liking, including the flavor, the type of sweetener and milk, and the amount of each ingredient. A variety of choices are offered, from espressos and lattes to iced coffees and hot chocolate. If customers create an account online, the system will remember their favorite order (of course, your friendly neighborhood barista probably does the same thing). While the convenience of such a machine is probably its biggest selling point, consumers who've sampled Briggo's brew tell The Salt that the quality of the coffee is nothing to sniff at, either. Unlike baristas in training, who need to figure out the tricks of the trade, their robotic counterparts have been programmed to control every aspect of the process, with the goal of creating a consistently tasty product. "The coffee tastes good and it always tastes the same," Yamit Lavi, a student at UT Austin, tells us. "I would say the consistency of the taste makes it better than a standard coffee shop." The machine, after all, can measure humidity, temperature, water pressure, timing and other such factors to a T. And while institutions host the coffee kiosks, Briggo retains ownership of the machines so it can closely manage the entire process, from origin of its direct-trade beans to cup in hand. Briggo isn't the only company to pursue a robotic coffee venture. There's also the Marley Coffee Machine, which croons Bob Marley tunes while the robot within the box prepares coffee from freshly ground beans. And Starbucks' satellite brand, Seattle's Best, is pairing with the company that owns Redbox to set up one-dollar coffee kiosks in hundreds of supermarkets across the country. And yet, although students at UT Austin enjoy the Briggo "Coffee Haus," many of them still hold on to the value of a real coffee shop experience. "At coffee shops you can build relationships with the people making your drink and have a more personal interaction," says Mina Ghobrial, another student at UT. "I believe that's very important in today's society, especially since electronics have taken over face-to-face interactions." The coffee kiosks don't have to eliminate coffee shops altogether. Instead, they can be a nice addition: something there when we need it — and not bad-tasting to boot.